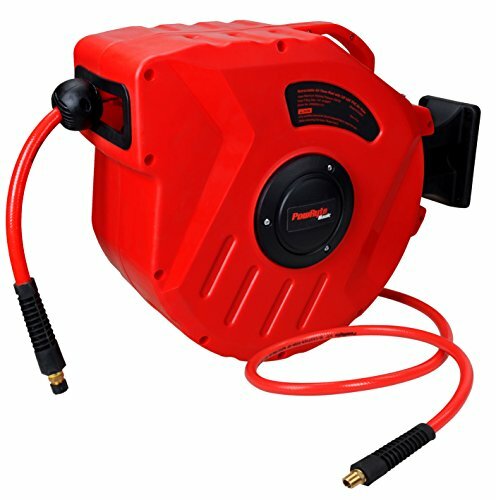 PowRyte Retractable Air Hose Reel with 3/8-Inch by 50-Feet PVC Hose is ideal for indoor shop and industrial applications. The air compressor hose reel keeps your air hose organized and protected for longer life. You can bring your air tools with you anywhere in the shop without the issue of tangling. The automatic hose reel, also called a self -winding hose reel or retractable air hose reel, features a spring-powered mechanism that makes the hose retract quickly, automatically and easily. The ratchet lock mechanism automatically holds a desired length of hose in place when drawn by the user. An enclosed, durable, high impact polypropylene case is crack resistant and protects the hose for long life. The swivel bracket for mounting hose reel on a wall or ceilling and make hose reel can be rotated from 0 to 180 degree. Excellent abrasion, kink-resistant outer cover and tube for extended life time. This hose also comes equipped solid brass end fittings will never corrode and seal better than aluminum, steel, or zinc. The bend restrictors reduce kinking and help to increase the life of the hose. Shop now with PowRyte Basic and you will never worry about overpaying anything. Specifically designed for entry level DIY workers, PowRyte tools maximizes your saving by delivering quality tools with the LOWEST PRICES throughout the market.